Are you looking for ways to save on decking? Or, do you just need to find a clear and easy way to remove ice from your wood deck? Building a deck and need to know what tools to use? This section will help you answer your questions and more. From deck maintenance to decking installation, this guide has articles that will give you the answers you need. If you find this information helpful subscribe to our newsletter for exclusive savings and even more helpful articles. 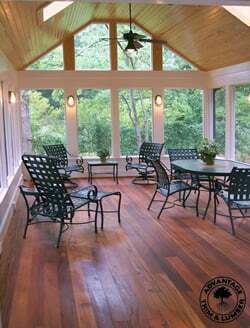 Can I install your wooden deck system over a stamped concrete patio? As long as you have an even surface, yes you can use our deck tile system. We have an aggregate screened in patio that we loathe. Would your deck tiles work to cover this? Also where do we purchase the tiles at? Our Deck Tiles can definitely go over any flat surface that’s stable and not slippery. How can I see your decking maintenance products? Many links are defunct. I want your oil for my deck and do you have a brightener? We do not have any upcoming events in Colorado and at this time we are not planning on Exhibiting this year at the Builders show. Let us know if you have any questions or if there’s something we can do for you.